All month long the marketing team here at Mozilla has been hosting a series of workshops to get people mobilized for the upcoming Firefox 3.5 launch. Tomorrow, Alix Franquet and I will join the fun with a short presentation on how you can use videos to help spread the word. 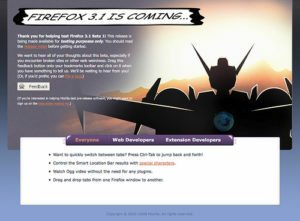 * Grand unveiling of a new community marketing campaign called “Fastest Firefox”. I think you’ll like this one. * Dial +1.650.903.0800, followed by 92# and then 7391#. * Or, you can use our toll-free number: +1.800.707.2533, followed by 369# and then 7391#. * If you’re outside the US, use Skype to call in with the toll-free number listed above. * If you can’t join the call — but want to ask questions — you can join us in #marketing on IRC (irc.mozilla.org). * You can also follow along (with sound and video) on the Air Mozilla marketing channel. Don’t miss the action…hope to see you there!